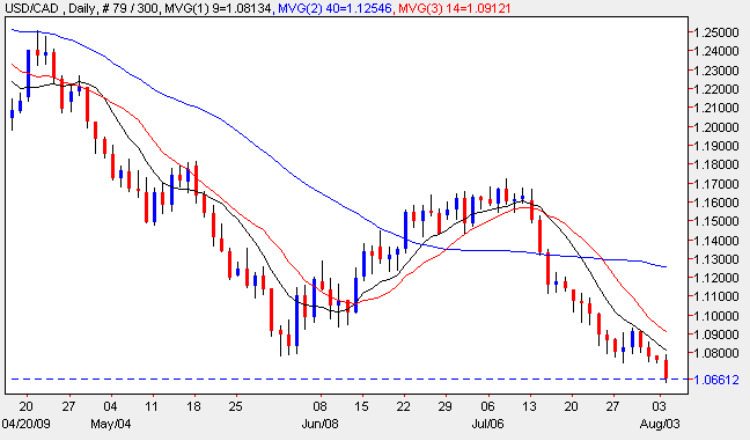 Despite the fact that it was a national holiday in Canada today, the usd to cad was not protected from the further weakening in the US dollar which was felt across all the major currency pairs, as investor appetite for risk continued unabated, with the consequent sell of in the dollar, with prices falling below the key 1.08 support level. With this region now breached, and the US dollar index chart looking extremely weak and potentially about to collapse, we could see a steep move lower in the US dollar cad in the next few days, with the first target being the 1.o5 level, and should this be broken then the next intermediate level is at 1.02, with parity just over the horizon. Both the weekly and monthly charts confirm this picture with all three moving averages weighing heavily or pointing sharply lower. It will take a dramatic shift in investor sentiment or in the fundamental news, to stop the rot now, and in the short term there is only one way to trade the US dollar vs Canadian Dollar, and that’s the short side.